Hancock has a likeable cast and an intriguing central premise but it's let down by a disappointingly uneven plot, painfully underwritten characters and dodgy effects. 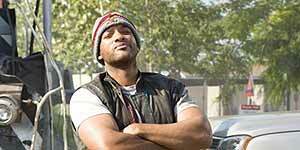 Directed by Peter Berg, Hancock stars Will Smith as John Hancock, a down-and-out drunk who also happens to be LA's resident superhero. Consequently, his frequently inebriated attempts at crime fighting usually result in millions of dollars worth of collateral damage. However, when Hancock rescues PR guy Ray (Jason Bateman) from an oncoming train, Ray thanks him by giving him an image makeover, the first step of which involves Hancock spending time in jail. Meanwhile, Hancock gets to know Ray's wife (Charlize Theron) and son (Jae Head) and as he sobers up, he begins to wonder about his amnesiac past. The film's central premise is intriguing and the idea of an alcoholic and bad tempered superhero is something of a breath of fresh air in this summer of superheroics. The film also benefits from a superb cast, with Smith, Theron and Bateman all sparking off each other nicely. Smith is clearly enjoying himself by trouncing his all-around nice guy image and the film has a few knowing laughs at his expense – such as Hancock's forced fake smile, as opposed to the trademark Smith grin. The problem is that the plot is all over the place and, for a comedy, it's not really all that funny. Spoilers preclude going into detail but there's a plot development that you'll probably see coming and once it happens, the film suffers badly from poorly-defined characters and unanswered questions. In addition, the effects work is dodgy in places, whilst the action scenes themselves are poorly directed, to the point that it's often difficult to tell what's happening. A likeable cast ensure that Hancock is never less than watchable, but the plot feels rushed and under developed and you can't help feeling that the film should have been a lot better.